I was reading some of my previous post from years back this evening. It sure is funny when you find all the mistakes. Like calling a coach a couch. That was probably the most hilarious 😂 one I came across. Well at the time I typed it it must have seemed right! 😝 LOL! I’m not going to feel bad because I’m not the best writer and especially do not notice mistakes right away. That’s just me and I’m ok with that. I think being perfect, and nobody is, but it seems so many think they are would be rather boring and stiff don’t you think? 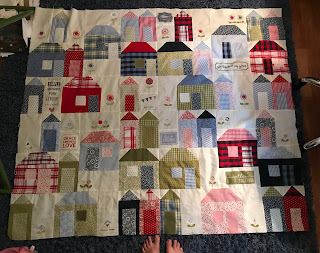 I started this sweet quilt on New Year’s Day, it’s called Oxford Lane by Sweetwater. 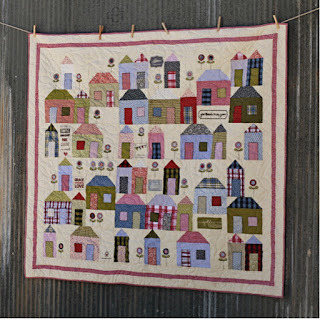 I talked about this quilt in my last post. This photo is owned by Sweetwater Co the designers of the quilt. Above is what my quilt will look like when I’m finished. It’s so cute these darling stacked houses. I made an error on mine and ended up with 3 skinny houses next to each other. Who cares I still love it. Just making a January update to my blog. I’ll be back next month with photos from our camping trip to Monterey. We plan on a 4 day trip there soon. Tomorrow I’m going to buy a new sewing 🧵 machine. Still keeping the Babylock Elissimo Gold 2 and my Juki. The new sewing machine I’m getting tomorrow is a floor model. It’s also an embroidery machine, although not uptown like my Elissimo Gold 2. I am purchasing the new machine for less than $700.00. It will be a great machine to carry along on trips and sewing events. I’m not sure what the regular price is, but I’ll be back to post about it. I think the name of it is Babylock Verve. So who knows maybe I’ll post again very soon. Beautiful job with the quilt, I didn't even notice the 3 skinny houses together. I think a lot of times when we are reading something if we know the context we read it the right way even if something may be spelled wrong, our mind just fixes things, I guess I don't read a blog to proof read but to enjoy what is being shared, so mistakes don't stand out to me :) Have a great time on your trip and enjoy that machine!